Fifteen year old Kristie Ahn made the trip to Mobile, Alabama, this year for her first USTA National Spring Championships. Seeded sixth, Kristie was not a shocker in the winner's circle, but she was certainly the youngest in the singles finals as she picked up yet another USTA gold ball. 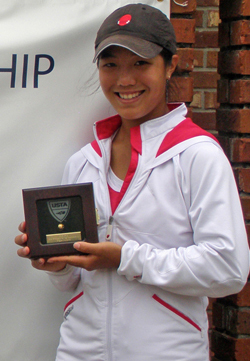 New Jersey native Kristie Ahn is no stranger to tournament trophies. Since 2005 -- when she was only 12 -- she's been consistently placing at national events. She finished that year as No. 3 in the 14s singles and No. 13 in the doubles, after placing at two nationals and sweeping a National Open in November. She started 2006 off right as the winner of the 14s at the USTA National Winter Championships, where she and Jennifer Kellner came in third in doubles. It was just the start of an incredible year as Kristie moved into the 16s with ease. She came in the top five at six more national events, finishing the year as the No. 1 singles, and No. 8 doubles player in the country. Kristie Ahn is not one to take the easy road so she moved up quickly into the 18s for 2007, but not before once again starting it off right on New Year's Day with third place in singles and the top prize in doubles (with Nicole Stracar). She followed up with a place in the finals of a February National Open and a win in a June one. She was back in Arizona for the holidays where she picked up yet another bronze ball at the USTA National Winter Championships -- this time in the 18s. 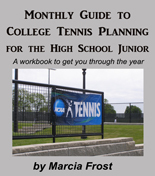 I sat down with Kristie at the USTA National Spring Championships. She would take her momentum from the singles win there with her straight to Texas, winning the singles and the doubles (with Kate Fuller) and reaching the spot as the No. 2 player in the country in the Girls' 18s.